There are several conservation areas in Forest Hill. If you live in one, then there are certain impacts on your rights. If you live in a flat or subdivided house, then you do not have permitted development rights and must seek planning permission to undertake changes to the exterior. This includes alterations such as such the erection of a satellite dish or replacing windows or doors. Check with the Council before making any external changes to your property. If your property is affected by an Article 4 direction (see below), then this removes your permitted development rights and planning permission may be required for certain minor changes, such as the replacement of windows and doors or front boundaries. Check with the Council before proceeding with any external works. It is an offence to cut down or wilfully damage any tree in a conservation area without prior written consent. A plant is considered a tree once it is over 1.2m tall with a trunk over 100mm in diameter. Applications are free, but should be made at least six weeks in advance. If you want to demolish (or rebuild) a wall over one metre high, or demolish a building then you must first apply for a demolition notice, giving at least six weeks' notice. Consent for demolition is not normally granted where a building contributes to the character of the conservation area. Commercial properties have limited development rights, and we recommend you talk to Lewisham's Planning department before undertaking any works. All shop fronts should comply with the Council's Shopfront design guide supplementary planning document. An Article 4 direction applies to the whole of the Forest Hill Conservation Area. The conservation area was originally designated in 1976 and extended in 1994 and in 2010. It now comprises an area of 45 ha which makes it the fifth largest conservation area within the borough. The area includes Benson Road, Bird In Hand Passage, Clyde Vale, Dartmouth Place, David's Road, Dorrel Estate, Havelock Walk, London Road, Manor Mount, Pearcefield Avenue, Waldenshaw Road, most of Wood Vale and parts of Dartmouth Road, Devonshire Road, Ewelme Road, Taymount Rise, Thorpewood Avenue, Westwood Park, Woodcombe Crescent and Waldram Crescent. Designated in 1975, this is the smallest conservation area in the borough, comprising ten properties in two terraces. An Article 4 direction applies to Mount Ash Road. 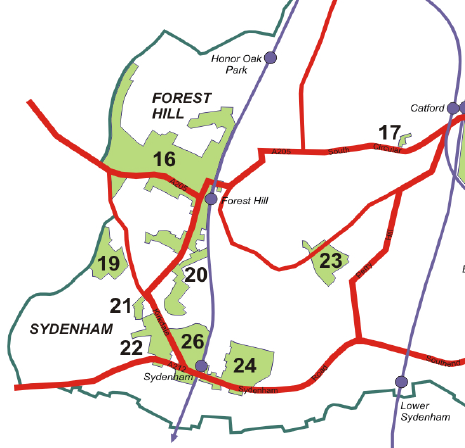 Sydenham Hill and Kirkdale Conservation Area was designated in 1976 and consists of three different character areas: Mount Gardens, Mount Ash Road and Lammas Green. Mount Ash Road to the south is a unique example of Victorian ‘byelaw’ housing designed as a set piece of identical three-storey terraces enclosing the road to both sides. Comprising Albion Villas Road, Carlton Terrace, Redberry Grove, Shrublands Close and parts of Sydenham Park and Sydenham Park Road, Sydenham Park Conservation Area was designated in 1973 and has a peaceful Gothic revival character which retains a degree of original integrity. Development took place in stages during the latter half of the 19th century, with a mix of detached, semi-detached and terraced housing. An Article 4 direction applies to the whole of the Halifax Street area. This small area was designated in 1972 and consists mainly of one street comprising a group of tightly-knit mid 19th century semi-detached houses set behind small front gardens and a few properties on Wells Park Road. Jews Walk Conservation Area was designated in 1973, the area consists of semi-detached villas in a Gothic Revival style, exhibiting high quality craftsmanship. An Article 4 direction applies to specific streets in the Perry Fields Conservation Area which covers Allenby Road, Garlies Road and parts of Perry Rise, Priestfield Road and Woolstone Road. To check whether your street is covered by the direction contact Lewisham Planning on (020) 8314 7400 or planning@lewisham.gov.uk. 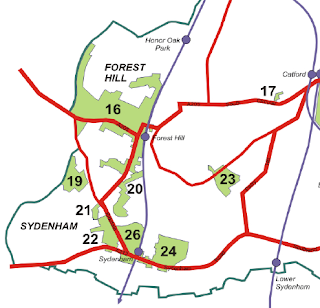 An Article 4 direction applies to the whole of the Sydenham Thorpes Conservation Area which comprises the Thorpes Estate, an Edwardian development consisting of six roads laid out between 1901 and 1914 by Edmondson and Sons. Cobb's Corner Conservation Area is one of Lewisham's newest conservation areas and was designated in 2007 following lobbying by the Sydenham Society.